The multifamily market in New York City slowed down significantly in April following a strong first quarter, with volume metrics dropping to their lowest levels of the year so far, according to a new report from Ariel Property Advisors. The first quarter of 2018 saw a solid rebound from the multifamily market’s painfully slow 2017, with dollar volume reaching almost $3 billion. But in April, dollar volume was at just $431.4 million, spread across 31 transactions and 41 buildings. This was a 48 percent drop in dollar volume, a 30 percent drop in transaction volume and a 42 percent drop in building volume compared to the six-month trailing average that ended in March. Compared to April 2017, overall multifamily dollar volume was down by 3 percent, building volume was down by 19 percent, and transaction volume was up by 7 percent. Pricing metrics were fairly stable, although Brooklyn saw some significant changes. Price per square foot in the borough increased by 20.9 percent, and cap rates fell by 5.5 percent. Brooklyn was also the only submarket to see an increase in dollar volume during the month. There were 11 transactions across 16 buildings in the borough for $223.62 million overall. This was a 62 percent jump in dollar volume, a 4 percent decrease in transaction volume and a 6 percent decrease in building volume compared to the six-month trailing average. More than half of the dollar volume was due to the borough’s largest sale at 461 Dean Street, which Forest City Realty Trust sold to Principal Global Investors for $156 million. Manhattan did not fare as well in April. 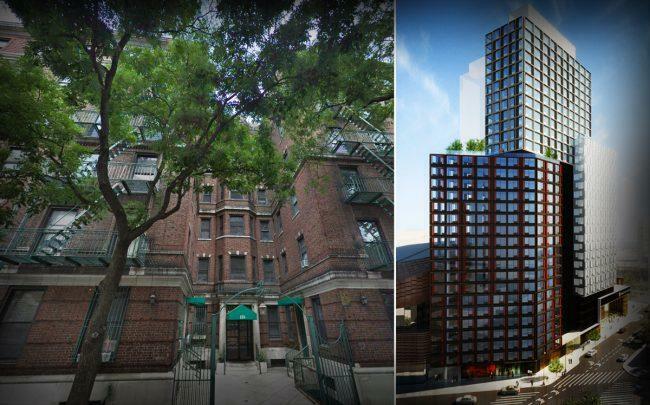 The borough saw just five deals for five buildings worth a total of $118.71 million. This made up just 28 percent of the city’s total dollar volume, compared to 54 percent in March. The borough’s largest deal was in Chelsea, where Raphael Toledano closed on his $49.21 million sale of 125-129 West 16th Street to AAK Acquisitions, LLC. Things were even slower in Northern Manhattan, which had the lowest transaction, building and dollar volume of all of the city’s submarkets in April with just three deals across three buildings for $18.25 million. The largest was the $7.2 million sale of 523 West 135th Street in Hamilton Heights. The Bronx was down in April as well, despite having a robust first quarter. The borough saw six deals across 10 properties for $46.5 million overall—respective decreases of 38, 47 and 59 percent compared to the six-month trailing average. The largest deal was Bernard Miller Entities’ $20.55 million purchase of 3508 Kings College Place and 3511 Putnam Place in Norwood from MPNY Realty Inc.
After struggling in the first quarter, Queens posted a mixed April, with six transactions across seven buildings for $24.35 million overall. This was a 33 percent increase in transaction volume and a 69 percent decrease in dollar volume, while building volume did not change. Its largest deal was the $6.3 million sale of 48-11 45th Street in Sunnyside.